parking | WorstPlans.com updates every Monday! Never run over a pedestrian or a bicyclist while looking for a parking spot, thanks to this new attention-saving idea! Personal injury lawyers hate it! It can be difficult to safely drive down the street AND find a parking spot at the same time. Many locations look like parking spots until you get right next to them (Figure 1) and see the fire hydrant / driveway / red curb (Figure 2). Fig. 1: This is a road with two opposing lanes of traffic separated by the dashed yellow line. Cars (black) are parked on both sides of the road. The red car is driving from left to right down the two-lane road. Question marks indicate possible parking spots, but which ones—if any—are valid and will also fit our red car? Fig. 2: Unfortunately, the locations above were all disqualified for reasons that were not immediately obvious (fire hydrant, loading zone, driveway, etc.). The process of disqualifying these parking spots is a dangerous distraction to the driver! A system with a LIDAR / radar and an integrated GPS unit would be able to constantly scan ahead for valid parking spaces. A LIDAR unit (a laser range-finder) scans in front of the car, looking for gaps between parked cars. If a spot is detected, SpotFinder checks the LIDAR data to see if the spot is big enough to fit your specific car. SpotFinder checks your GPS coordinates in a street map database, to see if there are any disqualifying reasons to not park in the spot (e.g. fire hydrants, driveways, etc.) even if there is physically enough space there to fit a car. Fig. 3: The LIDAR unit is looking at the right side of the street at candidate parking spot “E.” The spot is big enough to fit a car, but the map data indicates the presence of a driveway. No good! Fig. 4: Here, the LIDAR unit is assessing parking spots A, B, and C on the left side of the street. Fig. 5: Spot F is valid, but unfortunately isn’t quite long enough to fit the red car. PROS: Increases safety by allowing drivers to focus their attention on driving instead of evaluating parking spots. CONS: If the map database isn’t constantly updated, the system could occasionally suggest an invalid parking spot (for example, if a new driveway was constructed where a previously-valid parking spot had been). So the driver might get some false positives of suggested (but invalid) parking spots. Never pay for a parking spot downtown again with this one unbelievable tip from a disgruntled crane operator! In many areas of high-density housing, parking spots can be an incredibly valuable commodity. This is especially true of areas with heavy snowfall, since the snow temporarily reduces the amount of parking spots available. Unfortunately, there is no extremely easy way to add additional parking spots without major demolition / renovation to existing buildings. Call the crane with a remote control (like a garage door opener). Wait for the crane to lower the platform into the middle of the street (this may temporarily block traffic). Turn off your car and get out of it. Important: step off of the platform! Push the remote control button again to hoist your car into the air. Now your car is hanging 30 feet in the air, on a small parking-spot-sized platform, and you don’t need to find a parking spot. Bonus feature: protects your car from opportunistic theft and casual vandalism. If the building has an interior courtyard, the cars could be lifted over the building entirely and then dropped off in the (normally vehicle-inaccessible) central courtyard. This would mean that one crane could handle multiple cars. 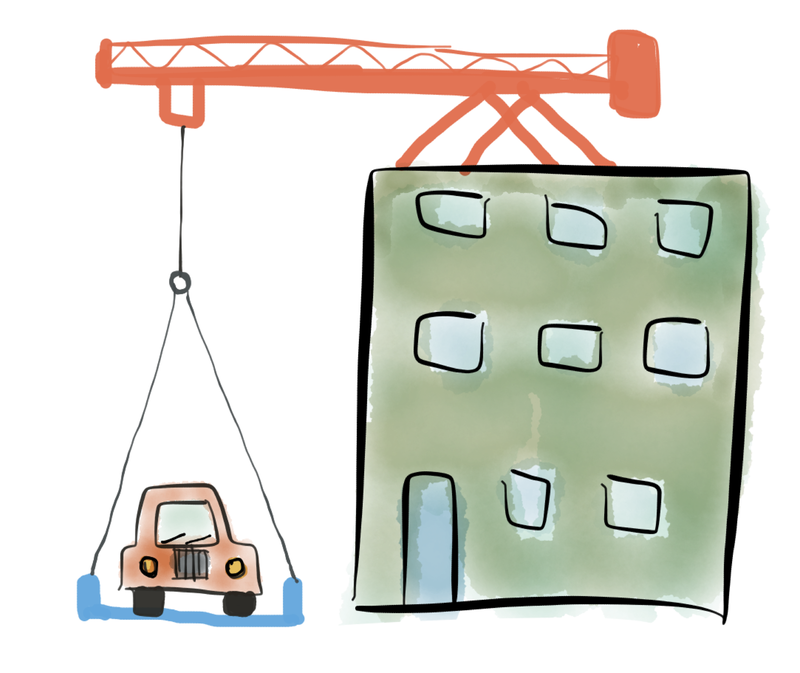 Fig 1: Here, the apartment on the right has a crane (or multiple cranes) which can pick up cars directly from the street. If this method of parking becomes extremely popular, cars may be built with additional “aerial parking” options. For example, a car could have a special roof rack that would be grabbed onto by a hook on the crane. This would allow the car be hoisted directly into the air without the need for a platform. Fig 2: Having to wait for a platform to lower before you can drive onto it would eventually become a bit annoying. But this issue can be solved by building a “lift point” into the car itself. The lifting bar here (which would be like a standard roof rack, except structurally integrated into the frame of the car) would mesh directly with the overhead lifting hooks, preventing the need for any sort of lifting platform. The whole process could even be automated with basic computer vision and proximity-detection hardware. PROS: Conveniently solves downtown / high-density apartment parking issues. CONS: “How would this system deal with high winds?” Answer: POORLY? Never forget where you left your car again, because your phone knows! Also your car is probably worth thousands of dollars, so you should be keeping track of it anyway! When parking on the street or in an enormous shopping center parking lot, it can be easy to lose track of exactly where one’s car is parked. Since cell phones constantly record a person’s GPS location as a standard feature (if you are not familiar with this, look up “iPhone Track location”—the images are quite striking), we can use this same data to reconstruct the car’s location when it was parked. Fig 1: Your phone typically does not make this data easily available to you, but it is constantly recording (and saving) your location. 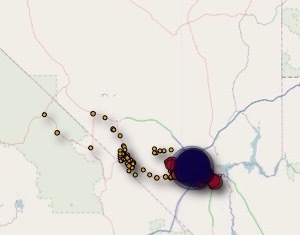 This is a low-resolution zoom-out of tracking signals of a phone taken to Las Vegas. Each dot on the map actually represents dozens or hundreds of specific location “pings,” which are just not visible at this zoom level. The black point cluster is Las Vegas itself. It would be useful if your phone could always tell you where your car was parked—without requiring any user interaction or planning ahead of time. When the user is driving, the pedometer should register no (or very, very few) steps. After parking, the pedometer should suddenly see activity. By examining the speed of travel between GPS coordinates. Data points that have an associated speed above 20 miles per hour are practically guaranteed to be in a car (or other form of motorized transportation). Car data points will still have interruptions (e.g. stop lights) and low-speed sections (e.g., traffic jam) that need to be accounted for. At some point, the driver will get out of the car and walk to their destination. This can be easily detected by the slower movement and non-zero pedometer data. See figures 2 and 3 below for an example of integrating these two data types (top of figure = pedometer activity bar graph, bottom of figure = map and GPS “pings”). Try to figure out the parking spot on the diagram below. Fig 2: Here is some fake sample data. The blue bars along the top (“Number of Steps Detected”) show pedometer / accelerometer activity from 9:02 AM to 9:10 AM (the more a person walks, the higher the bar). 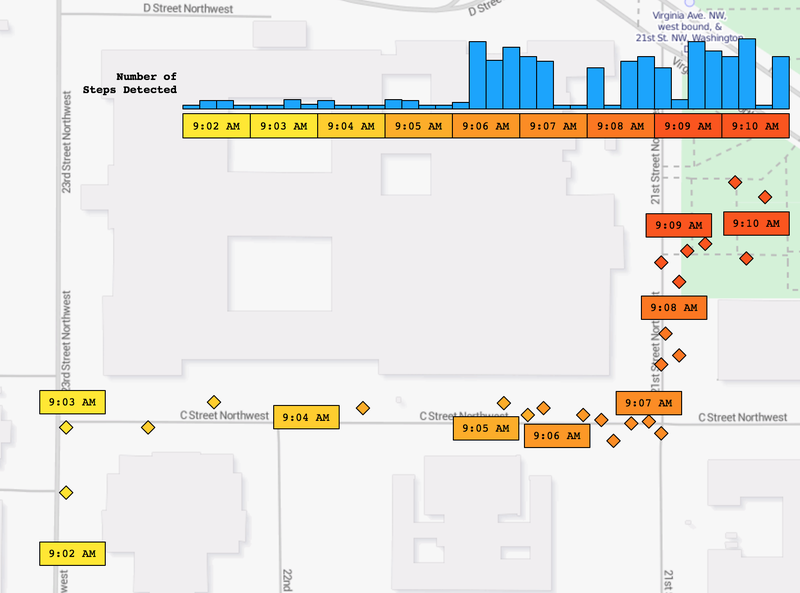 The yellow-to-orange-to-red rectangles at the bottom indicate the GPS locations at these specific times. Try to figure out where the user parked the car based on this data. See Fig. 3 for the algorithm’s guess. Fig 3: Here is the algorithm’s guess for the parking spot—see if you agree with this guess! This is an annotated version of the data in Figure 2. This feature should definitely be built into your phone! PROS: Automatically lets you know where you (probably) parked your car, and doesn’t need any data that a modern cell phone isn’t already collecting. CONS: Might not work very well in underground parking garages. Try to remember where you parked in those situations!